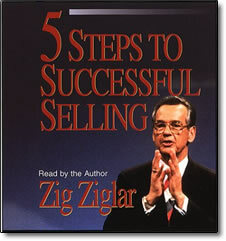 5 Steps to Successful Selling – CD or MP3 by Zig Ziglar – Discount! Great salespeople are made, not born. You’ve heard about “natural-born salespeople” — those super salespeople who seem to perform intuitively and succeed effortlessly. In 5 Steps to Successful Selling, Zig Ziglar shows you that those success stories result from study and observation rather than inborn talent. They are the result of mastering the art of selling. After learning the 5 Steps to Successful Selling — whether you are a beginner or a seasoned veteran — you can’t help but come away a better salesperson.